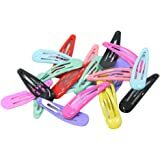 Snap clips for girls,covered with smooth material on the surface, not plastic surface,very durable and safe.They can hold on well and will not come off. 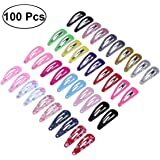 Tiny baby hair clips,size approx 2 inches.It is light to wear for babies,perfect for baby girls,infants,toddlers,little girls,kids,even women can use it for the hair decoration at home. 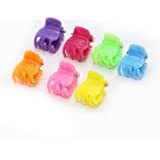 Our infant hair clips include 12 different colors,6 pieces/3 pairs of each color:purple,blue,green,pink,black ,orange,yellow,red baby girl snap clips. 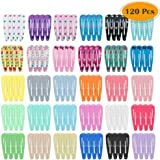 A set of variety colors snap barrettes,can match many occasions.Super cute baby girl hair clips make any outfits look pretty.A perfect gift for babies! 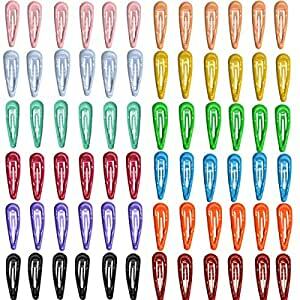 The toddler hair clips are packaged well to make it a perfect gift giving.This item can wear alone and look adorable on top of the baby hair.Cute and Vivid. 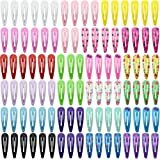 Metal hair clips,covered with smooth material on the surface, very durable and safe.They can hold on well and will not come off.It is light to wear for babies.Perfect gift for any girls,newborns,babies,toddlers,infants.Solid colored infant hair clips include 12 different colors,6 pieces/3 pairs each color.Super cute baby girl bows make any outfits look pretty.A perfect gift for babies! Our mission:to resolve every customer's requirement.We wish to offer every customer the best buying experience. 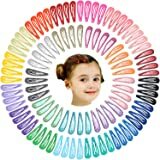 Note:CellElection is the brand seller,one of the companies that manufactures baby and adult wearing products.We promise that each product is 100% new brand,with high quality .Each product has a set of different colors or styles to choose.Our beautiful hair accessories would accord with your interest. 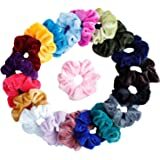 Mandydov 20 Pcs Hair Scrunchies Velvet Elastic Hair Bands Scrunchy Hair Ties Ropes Scrunchie for Women or Girls Hair Accessories - 20 Assorted Colours Scrunchies. 5.0 out of 5 starsThese are really wonderful for fine hair. 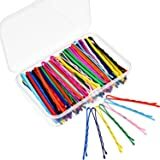 Bobbi Pins, other clips do not work in holding fine hair, THESE DO. I do not care for using Hairspray, These will keep my hair secure and out of my face without the goo of hair spray. 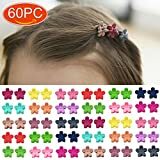 5.0 out of 5 starsColorful, fun and great for every type of hair! 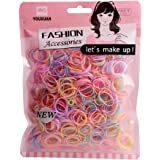 I use these in my granddaughter’s hair. 5.0 out of 5 starsPerfect. Just as shown. My little sister just had a birthday and asked for these! I got them for her and she was more than satisfied! 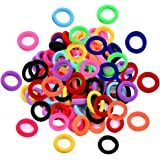 I ordered these and it only came with 62 barettes I recommend them but you might not get the whole set.